Most people that know me well know that I am not entirely a big fan of sports or energy gels. The main reason I have been critical of them is more from an education point of view than anything else. Consuming a very high concentrate of “glucose” requires a very specific reason and more often than not gels are used and abused under conditions that do not warrant consumption. Gels are very much not always healthy and one of my other main reasons is the fact that I see it as a massive litter item, when tearing off the top and tossing it. Let’s first look at some key sports nutrition facts to make all of this clear. The type of event you are doing more often than not will limit the type of fuelling you will be able to use during the event. Swimming, Cycling, Running and Track and Field Sports all have their technicalities, etiquette, timing, rules and regulations. Supplementation is there for convenience and an athlete will need to decide if the type of fuel feed he is looking at is simple and convenient under those conditions. Doing a trail run or ride doesn’t make it easy for a gel feed as you cannot simply throw the tear off on the floor as this can lead to penalization and in some events disqualification. The environment needs to be taken into account. Doing a long open water swim falls under the same category of what are you going to do with your litter. Cycling vests have pockets and make it more convenient to carry but again the used gel sachet needs to be kept intact and not just thrown away in the middle of nowhere, so from a convenience point of view they are not always ideal. Secondly how long is the duration of the event? Is it a fast 10km run or is it a long slow ride or run. If you are going to use a gel feed for a short fast distance race it’s easy to feed prior to the event or run with one sachet and take at a later stage, but if it’s an ultra-marathon are you going to carry your big gel supply in sachets squashed in between your shorts and waist, or an additional race belt to carry them on route. Then palatability comes into play in that the sweetness can be tolerable a couple of times but if an athlete would try to consume many gels over a long period of time the taste and feeling can become nauseating and intolerable. Intensity plays a key role in the decision to use a gel during an event. If you are performing at a controlled pace where you are breathing quite comfortably consuming a gel might not be the best idea. Intensity often determines the feed. At a lower intensity a stability feed would be better suited to providing balance and sustainability as opposed to very high intensity where a quicker fast releasing carbohydrate feed would be required. Taking a gel which will spike your blood glucose levels is a terrible idea when you don’t need the spike, as your digestive system won’t easily process all the glucose and this can lead to GI (gastrointestinal) distress. Another big reason for GI distress with gel consumption is often not consuming a sufficient amount of water with the gel. Consuming a large amount of concentrated carbs in a single gel dose requires a certain amount of water to be consumed with it in order to lower the osmolarity of the combined solution assisting in an increase in the absorption rate. The number of times I have seen athletes consuming gels without adequate simultaneous fluid intake has been numerous and it often leads to gastric distress. This is why temperature plays an important role. In hot conditions it’s pretty easy to consume the amount of required fluid with a gel which I recommend to be at around 250-280ml’s of water. However on a cold day where hydration requirements are a lot lower one needs to be careful to consume a gel and then avoid the fluid consumption so as not to cause bladder discomfort. In cases where the temperature is lower I often recommend splitting the gel feed over a period of time as opposed to once every 45 minutes to an hour, to help lower the impact on the digestive system and provide a little more comfort and stability. Of course it’s not easy to open a gel and then not use it as it has the property of leaking once open which is not ideal, but I would take gastric comfort over a mess any day. Now let’s take a closer look at the properties of a gel. Most gels are made up of a combination of carbohydrates and a few contain protein. The majority of gels use glucose, maltodextrin and fructose. Many times the straightforward name of fructose is often masked with the fancy wording of fruit juice concentrate, and in some cases they will even go as far as saying mango or apple juice concentrate, but let’s keep it simple this is fruit sugar and is fructose bottom line. Maltodextrin is not classified as a sugar due to its complex carbohydrate bonds, but a closer look at maltodextrin will tell you it is truly a blood sugar spiker of note and can reach up to 135 on the glycemic index. One of the biggest issues I have with maltodextrin is not the spiking properties but the fact that most brands use genetically modified (GMO) corn starch for maltodextrin. If I see a gel with maltodextrin in it I advocate complete avoidance unless one can ascertain 100% that the starch is not genetically modified which is rare. I haven’t found a maltodextrin based gel locally that is GMO Free. Aside from the carbohydrate content which is the foundation for any gel, there are other additives which need to be considered. Protein as an ingredient often forms a small percentage of some sports gels on the market. Although protein is not there to provision energy during exercise, it can certainly assist with stability and a sense of fullness to keep those hunger cravings at bay. In long endurance events I always advocate some protein specifically for stability and during stage racing I am a fan of it during an event especially towards the end of the stage so that the protein in the system can immediately begin to assist post stage with the recovery process. Flavoring, colorant and preservatives all form part of gel to provide taste, texture and of course shelf life stability. In Europe non-nutritive sweeteners in a high calorie product such as a gel are restricted and this is something to keep in mind when deciding on a gel purchase. The research into non-nutritive sweeteners such as Aspartame, Acesulfame-K has shown to be detrimental to human consumption and its best to limit intake if not completely avoid. Gels are one of the most consumed endurance sports products on the market and careful scrutiny of contents should always be in mind to ensure you put health and safety before performance. I cannot even begin to tell you how many times over the years I have had requests for a 32Gi energy gel. It’s not that we never wanted to launch one it’s just that with all the above in mind it was important that we did the proper research and then extensive testing with our athletes. We had to ensure it was good from a health & performance perspective and of course made sure that the packaging we decided on was suitable to all types of sports and more specifically environmentally friendly. Let’s review this unique gel which is going to be launched this week. Upfront I need to state that the 32Gi gel will form part of the Accelerate performance series. It is a performance gel which does cause a blood sugar spike and it has been designed this way specifically. The 32Gi gel base we selected is natural brown rice syrup. The reason for selecting this as a base was very straightforward. We wanted a product which is as natural as possible, which in no way contains any genetically modified ingredients and is gluten free and fiber free. Brown rice syrup (rice syrup) is the well advocated as the quit-sugar/sugar-free lobby groups. It consists of around 45% maltose, 3% glucose, and 52% maltotriose (a trisaccharide consisting of three glucose molecules joined together). The Australian GI institute has tested brown rice syrup to contain a GI of around 98 which is slightly below that of glucose but perfectly suited to high intensity exercise fuelling. The carbohydrate itself breaks down into the 3 carbohydrate components of maltose, glucose and maltotriose which have varying properties, allowing for excellent absorption and lowered risk of GI distress. Rice syrup naturally contains a tiny portion of protein which allows for some stability. The gel contains over 90 Calories of glycemic carbohydrates which is a completely adequate feed. What I really like about brown rice syrup is that the actual taste is not overly sweet, the texture is not too thick and not too fluid making it fairly easy to consume and of course it is very natural. The only other components to the 32Gi gel are that of sodium in its natural salt form and potassium which assists with mineral loss and of course fluid absorption. 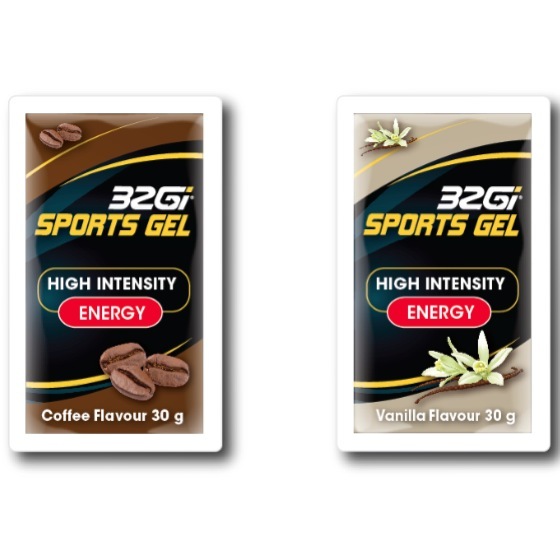 The gel is being launched in two flavours at first which is vanilla and coffee. The vanilla is a natural flavour and it contains no colors whatsoever, so in short it’s an extremely clean product from a health perspective. Gel packaging is legacy and has been for many years. Most gels use a pouch packaging method which involves a tear at the top and squeezing it out. Some gel manufacturers do offer dispensing containers for those athletes that use gel bottles which can be quite convenient. We will be providing bulk gel packaging for dispensing in the near future. We looked around in Europe, Asia and the US reviewed many variants of gel sachet packaging which we felt to be not just costly but not very convenient or environmentally friendly. We were approached by a company that does liquid packaging in a unique patented sachet format which requires no tearing at all, and once we took a closer look at this we realized this was definitely the way to go. It’s a simple packaging which in short can be described as flat as a credit card and similar in size. It’s a one handed snap, squeeze and eat, no tearing with the teeth at all and no worries if you have gloves on a cold day, it’s simply ingenious. The best part of it is a runner can shove a fair amount around his waist on the inside of his running shorts or tights and it won’t bother him and won’t fall. A triathlete can easily carry a few in the suite without it irritating. It also easily fits into a top tube bag on the bike for those long Ironman rides when you want to carry fuel on the bike. When we did our athlete testing we asked a number of ultra-runners to do a 56km run with at least 5-6 of our gels on them. The feedback was unanimous from a convenience point of view. It’s a runner’s dream carry. When the cycling community tested it, we got great feedback on it being environmentally friendly and in the mountain biker community it was even more widely adopted as not just environmentally friendly but also easy to open especially on a technical terrain where focus is required on the route and not on the feed. A big thumbs up was also given on the fact that with one hand all the gel could be squeezed out of the packaging with no remains left behind. This is due to the even pressure applied by the package fold forcing the gel to exit the packaging once opened. We have often prided ourselves on not just succumbing to the mainstream and the copy cats. We like to be innovative and we want to make sure that when we put a product into the market it has been properly tested from a functionality, taste, texture, packaging and convenience point of view. We also don’t just test our products on cyclists, we ensure the testing is carried out across a wide variety of sports, we listen to the athlete’s feedback and we go back to the drawing board if required. I personally feel that the 32Gi Sports Gel is going to make many athletes very happy in that from a health perspective there is no nonsense, from a functionality perspective it works well and from a convenience perspective it simply delivers and of course from an environmental perspective it’s definitely a brilliant no tear and drop option to keep the planet clean.